As well as sewing and teaching, I love to get out and about meeting people! If you love good design, British wildlife or sewing, it'd be great to see you at one of these events soon. Join Jo at her home and studio in Whitgreave, just outside of Stafford, for the Summer Open Studio Weekend. Be the first to see a brand new range of original designs, fabric by the metre and sewing kits, launching at the Open Studio! Mini workshops and demonstrations will be taking place throughout both days, plus enjoy drinks and nibbles in support of Women’s Aid. Entry is free. Jo will have a selection of kits and fabric available at this event, plus gifts and homeware. 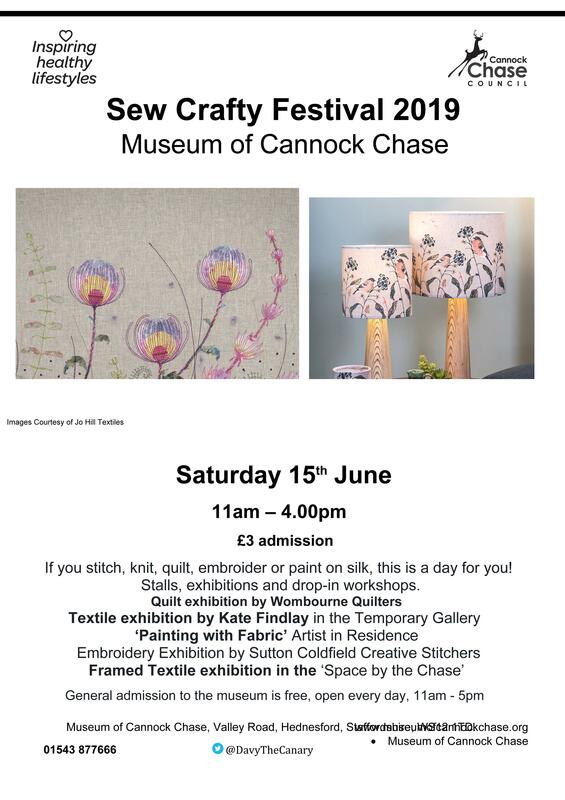 There are exhibitions and demonstrations taking place on the day too, in the lovely setting of Cannock Chase. A first for Jo Hill Textiles! We’re excited to be exhibiting at this prestigious flower show. Look out for a brand new design, launching at the show. A great day out for all sewing enthusiasts, and another first for us! Jo will have a wide range of kits and fabric by the metre available for crafters, dressmakers and interior designers. A day full of inspiration and creativity with hands-on workshops, fantastic independent makers and delicious food and drink to enjoy! If you are creative, this is the day out for you. We'll have a wide range of kits and fabric by the metre, plus our colleciton of homewares including a brand new design for autumn, launching at the show. Credit/debit cards accepted at all events.